The term encryption is what Folder lock is known for delivering quality protection against the hackers and snoopers. This software uses AES 256 bit encryption that has no loose ends till date. In fact, the creators of encryption themselves have claimed that their creation is nothing less than perfect as nobody can access your data when in encrypted form. Folder Lock is desktop security software that is easy to use and requires little or no learning curve. Most importantly, it encrypts your folders, ensuring that your sensitive folders are never compromised. Whether your computer is stolen or hacked, with your folders safely inside encrypted lockers, there’s no chance your folders can be hacked. Encrypting you Folders is easy and requires only a few steps to get fully protected. First, run Folder Lock, enter your master password and then click on the ‘Encrypt Files’ button. To encrypt Folders, you need to create lockers, each locker will have its own unique password and will be self-executable. This means that the locker can be independently accessed without having to rely on Folder Lock running in the background. Now, click on the ‘Create Locker’ button. Once you click the ‘Create Locker’ button, the locker creation wizard will run, follow the instructions that are provided by the locker creation wizard. 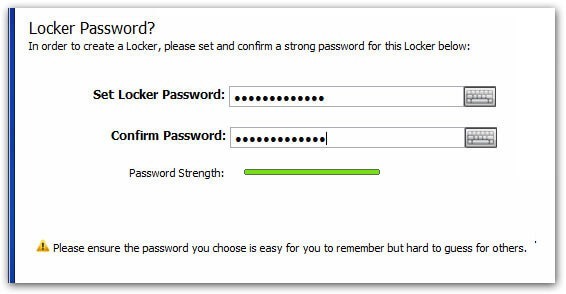 You will be required to setup a password for your locker. Go ahead and setup a strong effective password. Keep in mind that if you forget your password, it cannot be recovered, and you will not be able to recover your data. It is recommended that you use the virtual keyboard to enter your password, as this feature will prevent hackers from recording your password using a keylogging software. Once you have setup your password, follow the creation wizard instructions, and select the type of locker you wish to setup. There are two types of lockers to choose from – these are portable and basic. One important thing to consider is the type of locker to select. If you want to store large amounts of data into your lockers and don’t care for portability, you are better off creating a basic locker. If you want to add your lockers to an external drive in the future, your best option will be to create a portable locker. Next, follow the locker creation wizard. In the next screen you will be prompted to select a size range for your locker, your choice can be contingent on the space available in your hard-drive and the size of data you wish to place inside the locker. 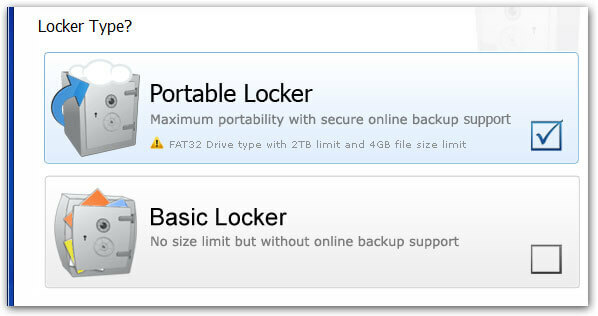 Portable lockers range from 300 MB – 2 TB, while basic locker range from 20 MB – 14 TB. Once you are done selecting the size of your locker, click next to complete the locker creation process and then press finish. To start adding data to your locker, simply check mark the ‘Open Locker on Finish’ option and then press finish. Now your locker has been created, from encrypt files menu, you are now given a variety of options for your locker. You can open the locker, edit the locker or simply close the locker when you are done adding your data. Furthermore, you can also backup your locker to our dedicated cloud storage service ‘Secure Backup’. The reason why AES is so perfect is that previously, different types of encryption came into place namely blowfish, Twofish etc. which weren’t as good as AES-256-bit-encrpytion. Hence, all the drawbacks that existed in the former versions were eradicated and hence, came into existence the perfect version of security.